This laptop from Hi-Grade looks better than many more expensive systems. A curious design quirk spoils the effect, though. You can't tilt the screen back as far as we'd like and while this won't cause any problems when the notebook is sitting on a table, it can make positioning more difficult when it's on your lap. Once you do have the system set up comfortably, you'll discover that it doesn't have the best of specifications. The CPU is a Celeron-M 420, the hard drive is a mere 80GB and you only get 512MB of RAM. Somehow, it does still manage to deliver a reasonable 199 score in MobileMark 2005, and arguably more importantly, the battery life effortlessly outstrips the Acer at 159 minutes. The Notino comes equipped with more ports than we'd expected, including a FireWire socket at the front of the system and a DVI port on the left-hand side. The latter comes instead of a VGA port, though, so you might need an adaptor before you can connect it to your display. The screen makes the most of its 1280 x 800 resolution and delivered impressively accurate, crisp and colourful results throughout our tests. 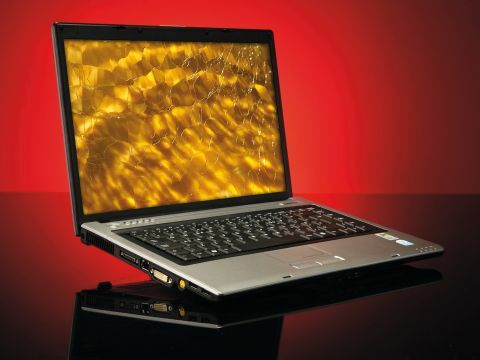 Yet 3D performance was poor even by the standard of budget laptops, with the integrated GMA-950 graphics delivering a 3DMark 05 score of 426. Which in gaming terms means "don't bother". The Notino seemed to get a little warm in use, but not enough to be an issue. It's fractionally below average weight at 2.75kg and overall proved a pleasant system to use. The hardware spec isn't quite good enough, though, and therefore we'd recommend you spend your £500 elsewhere.